This is probably more what you remember (if you haven't been here any more recently than the Internet Wayback Machine than you also remember the bar along the right-hand side not lining up for two months in 2007). I've added a Twitter feed here and there, but otherwise the layout and colour scheme of this blog have been static since we opened December 2005. The big motivation for this change was the YouTube widescreen videos: going to a nice clean blog layout where I could make the post widths more accomodating was the big plan here. This blog isn't quite optimized for wide-screen monitors, but it wouldn't hurt. 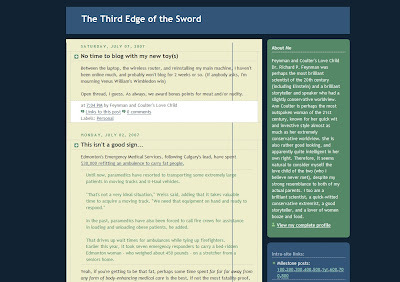 The total blog width does remain at a nice 1024 pixels. I figured this would be appreciated. There have been a few other changes as well: the most noticeable is that IntenseDebate® has been loaded up as the official new commenting system used at Third Edge of the Sword. I don't exactly get enough comments to encourage IntenseDebate®, but the new layout seemed to vastly disagree with the comments system. It has also disagreed with my dashboard and quick-edit link options, which is rather annoying. Not that any of you would notice. So IntenseDebate® is now locked and loaded on all new posts. Old posts get a little trickier: if there is already comments, then IntenseDebate® will not load -- but you cannot post using the old comment method. There is some sort of glitch keeping IntenseDebate® from allowing Blogger blogs to import all old comments, which is a bit of a shame. Hopefully that gets up and running again, and you can get back to a happy lifetime of commenting on David Swann's medical lies, Miley Cyrus probably not kissing Ashley Tisdale, or how awesome it is that Lily Tran has died. The other big change is Twitter-related: with the rise of the hashtag and the already loaded labels on Third Edge of the Sword, it made sense to rearrange some of them. 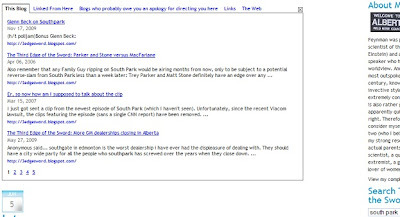 As a result, "Edmonton Current Events" (an already unwieldy name) has changed to "#yeg". "Hockey" becomes "#NHL", "Baseball" becomes #mlb, "Canadian Politics" becomes "#roft", "American Politics" becomes #tcot, and "Alberta Politics" becomes "#ableg". There are a few smaller changes as well: up in the top left corner you can find quick links to my Youtube, Twitter, and Facebook pages. There is a slightly expanded "About Me" section; also if you're all into that fancy RSS thing, you may notice that the RSS feed for Third Edge of the Sword is up in the top left corner too. 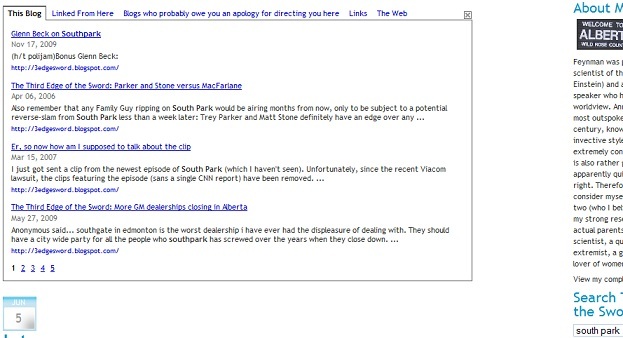 Another link remains at the bottom right corner of the page. Other than that, though, not much else different 'round these parts. There is a nice calendar icon now to indicate dates, I guess. As usual, any questions, comments or complaints, please feel free to join in the IntenseDebate®!